The CL Financial bailout has been a major public concern since it was announced on 30th January 2009 and I have been critical of the steps taken by the current administration to deal with the collapse of what was the Caribbean’s largest conglomerate. 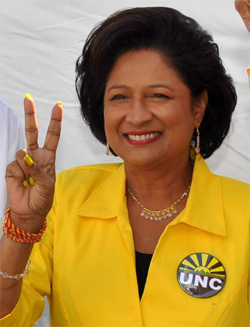 The leader of the Peoples’ Partnership (PP), Kamla Persad-Bissessar, has been noted for her strong criticism of the actions of the then Minister of Finance in making early withdrawals from the CL Financial group before the collapse. Her arguments in the Parliament are an important part of the story of this fiasco. National elections are tomorrow, with the distinct probability of a victory by the united PP, so it is timely to consider the way in which that group might handle the bailout. Robert Mayers – Deputy Leader of CoP and former Managing Director of CMMB – Mayers retired in November 2008 and was reportedly the financial adviser to Lawrence Duprey. Mr. Mayers is not listed in the CL Financial Annual Return of 17th February 2009 as a shareholder. Mervyn Assam – Former Trade Minister with UNC in the 1995-2000 period and UNC Senator up until the dissolution of Parliament in April. Assam was a founder of CLICO Investment Bank (CIB) and its last Chairman before the collapse. Despite the heat and temper of the election campaign, we have heard nothing on the role of Assam in the collapse of CIB. Yet again, the ‘Code of Silence’ is suspected, by negative inference, as it were. There seems to be some tacit agreement between the contending parties on this controversial matter. Mr. Assam is listed in the CL Financial Annual Return of 17th February 2009 as #22 of the 325 shareholders, holding 7,500 shares. Dr. Bhoendradatt Tewarie – Former Principal of UWI (St. Augustine), Director of CL Financial and Republic Bank Limited at the time of the collapse. The Foundation for Politics and Leadership, which was founded by some of the leading figures in the Congress of the People (CoP), headlined Dr. Tewarie to speak at their January 16th conference ‘Thinking Ahead – Governance in the 21st Century’. 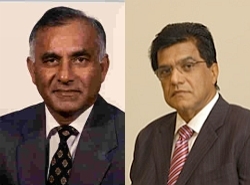 Tewarie is reported to have been one of the Directors who was present at the last Annual General Meeting of CL Financial on 23rd January 2009 at Trinidad Hilton. Yes, that is 7 days after they paid the final dividend; 10 days after they wrote the Central Bank and 7 days before announcing the bailout. Again, Tewarie is also silent on those events in the CL Financial Boardroom. Dr. Tewarie is listed in the CL Financial Annual Return of 17th February 2009 as #290 of the 325 shareholders, holding 1,171 shares. Carlos John – Former close aide of Lawrence Duprey and Director of CL Financial. Now visible at political meetings and has reportedly been recently canvassing in support of the PP’s St. Joseph candidate, recently-retired High Court Judge, Herbert Volney. Mr. John is not listed in the CL Financial Annual Return of 17th February 2009 as a shareholder. Taxpayers’ protection for CL Financial shareholders – The Shareholders’ Agreement of 12th June 2009 extended the bailout protection to the shareholders of the collapsed group. For the interests of shareholders to be protected in this situation is contrary to good sense and violates elementary principles of good public policy. It is unprecedented anywhere else in the world, including Nigeria, as shown in ‘Finding the Assets‘, published in the Business Guardian on 19th November 2009. Literally, it is a case of ‘Only in Trinidad & Tobago’. Question is, will a PP administration be reversing that corrupt decision? The strategy behind the bailout – Most importantly – ‘What is the strategy behind the bailout?‘ On 31st March, there was a major press conference of the CL Financial leadership to announce the resignation of Dr. Euric Bobb and the appointment of Marlon Holder as the group’s new CEO. The promise to provide accounts and a strategy was a key feature of that event and it is awaited. The usual suspects are now on the frontline. No accidental tourist here. Can they repair the damage they have done? or Will they act in enlightened self interest? I guess the only prize for guessing right is the lack of surprise, eh? With the new Cabinet to be announced later this week and appointments to SPE Boards to follow, this is the time for us to make our views known. Did we vote for Change, or was it simply Exchange? In my view the public must NOT be saddled with any of those irresponsible people from the so-called ‘responsible classes’. Those people and our collective failure to deny them positions of responsibility, are the direct cause of the sad state of affairs in our country. Specifically, the people who sat at the controls while CL Financial drifted onto the rocks must not be allowed to return to public office and esteem without providing a full account of the events leading up to this Caribbean catastrophe. The ‘Code of Silence’ must be dismantled, brick by brick, if necessary, if we are to progress. At the very least, we should be banishing them to obscurity. Please join us here again.